Stainless steel vacuum flask and mug set half litre for two. An ideal accompaniment for the Land Rover vehicle owner. Carried in a fully padded easy clean and washable cool bag. A stylish set benefiting from a slim line vacuum insulated design, highly effective against temperature change. Able to fit comfortably in most vehicle glove compartments this set is particularly suited to Land Rover owners. Manufactured from light weight stainless steel, this set is an ideal accompaniment for all outdoor events, this vacuum insulated flask pack and travel mugs set, contains everything required for that deserving tea or coffee break. The flask will keep your drinks hot for up to 12 hours and cold up to 24 hours. Manufactured with quality in mind, this flask pack represents outstanding value for money. A quality flask pack and travel mug set to all. 1 X Half litre stainless steel thermos styled vacuum flask. 2 X Insulated mugs double walled with lids. 2 X Stainless steel spoons. 2 X Condiment holders for storing Sugar, tea, coffee or milk. This flask set is excellent value for money and makes a great gift, Virtually unbreakable stainless-steel construction, the flask has been manufactured with a wider mouth for storing all foods, ice cubes and all kinds of beverages, hot or cold. Each mug comes with its own spill-resistant lids, perfect for keeping your beverages hot or colder for longer. 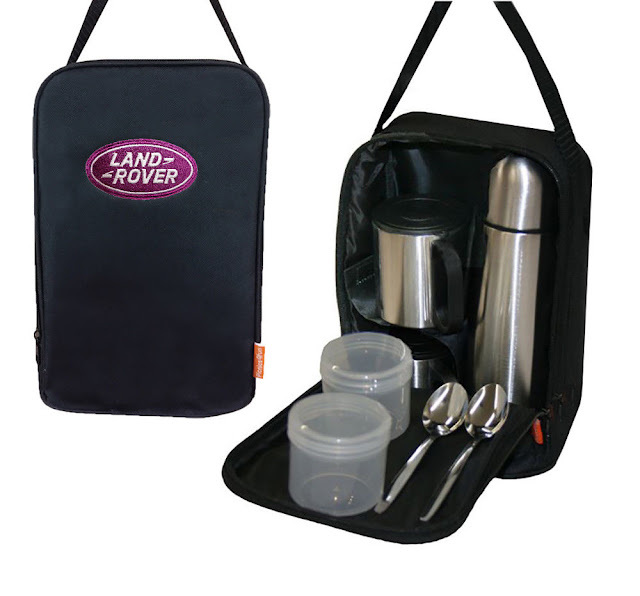 The flask set is carried in its own fully padded thermal insulated canvas style cool bag. Size 250 mm X 80 mm X 170 mm. The thermos flask is a traditional, slim-line design and is vacuum insulated. Highly effective against temperature change. Flask top is equipped with the auto stopper system to aid easy pouring.